“I wanted a studio,” said Bella Vine. 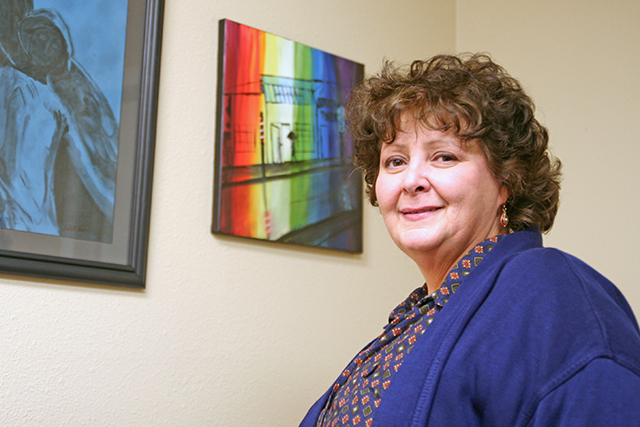 Now she directs a cluster of studios, an art gallery and oversees Art Expressions: The Art Experience and Learning Center, which provides classes for artists of all ages at Taag Studio and Gallery. Taag, which stands for Towncrest Area Artists Group, is located at 1041 Arthur Avenue on Iowa City’s East side. What began as a personal quest for her own artistic needs soon blossomed into a community of artists — one that was formed outside the traditional downtown arts scene of Iowa City. Out of frustration with the tight real estate market in Iowa City, Vine told her pastor about her predicament and he suggested she talk to Towncrest Investments. She landed space in an old dentist office but had a few extra rooms. Since moving into her new space, other artists have came forward in search of space to practice their art, and Vine now oversees 17 studio spaces at Taag. Taag opened in June and is still in development, seeking scholarships for area youth, volunteer teachers and donations of art supplies for classes. The downstairs studio is still under construction, and touts a fully equipped woodshop and electric ceramic kiln (a donation from community members). Another surprise for Vine was when she was able to begin mentoring a young man. He sought her out when he heard there was an artist with painting expertise in the neighborhood. The young man, a seventeen-year-old prodigy, was struggling in school, even contemplating dropping out before he met her. Now his grades are up, he has a part-time job and is looking at attending art school when he graduates. She keeps her mentoring sessions to just two hours per week, but the young man would be happier with 20 she said. Her mentorship extends beyond art skills; she’s helping her apprentice with school work and life lessons. “I had no idea it would affect him like this. It was not in my plans, but I will never stop doing this because of the effect it can have,” she said. Another young artist came to her for mentoring, but Vine had to turn her away and is currently seeking more mentoring artists to volunteer time for young artists in need. Parents from the neighborhood have asked about classes for their kids, but most will have to wait until funding comes through. Taag has non-profit status in Iowa and is waiting on federal 501(c)3 non-profit status. The organization has tapped artist Tami Recker as a teacher (she teaches an open-ended class for young people called, “Cultivating Creativity”) and as the development director to raise money for the burgeoning art school, studio center and east-side artist enclave. 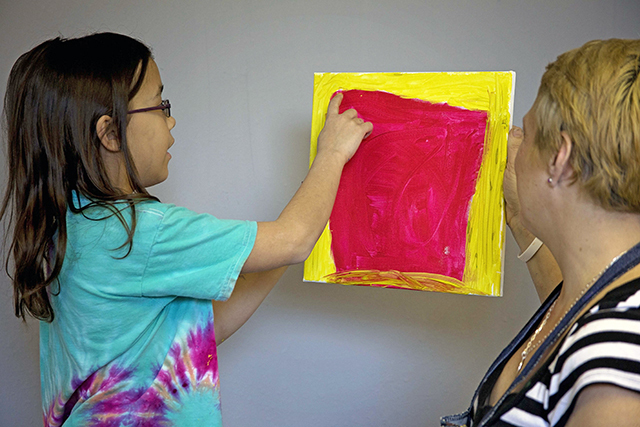 “The thing that interested me most was that Bella wants to offer scholarships to make art experiences available to children who might not be able to afford it,” said Recker. Recker (pronounced ‘Raker’) believes in the mission of Vine’s art space, and donated time and effort to the cause. In planning their development campaign, Recker is first seeking to spread the word. “Taag is built on a ‘foundation of faith’ in our community. Faith in the sense that it’s a big undertaking but also this is something our community needs and will help make happen,” she said. 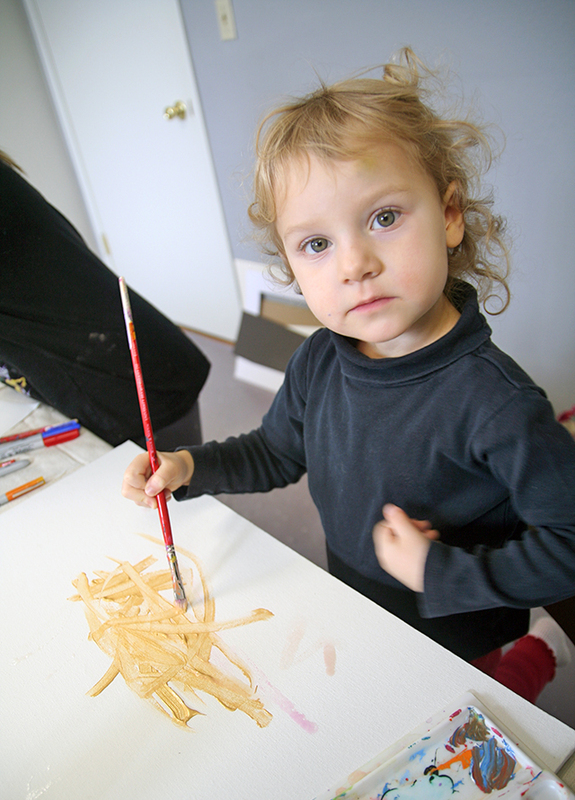 Donations of volunteer time, art materials and financial contributions have already helped Taag bring dozens of art classes to kids. But over fifty kids are still waiting on scholarships to attend classes taught by Recker and other volunteer teachers. In addition to the Taag classes through Art Expressions, Recker teaches one-on-one art classes for young people and works with parents to foster creativity and confidence in art. She also teaches at Purple Bloom Preschool. “Grass-roots spaces like Taag not only provide opportunities for making art, they create communities of artists for neighborhoods in need,” Recker said. Taag has a two-person show that opens on Saturday, Dec. 20 with a reception from 5-8 p.m. in Taag’s gallery at 1060 William Street (the old Eye Associates building). Jen Woods does portraiture and landscapes mostly working from photos taken by a South Carolina photographer. 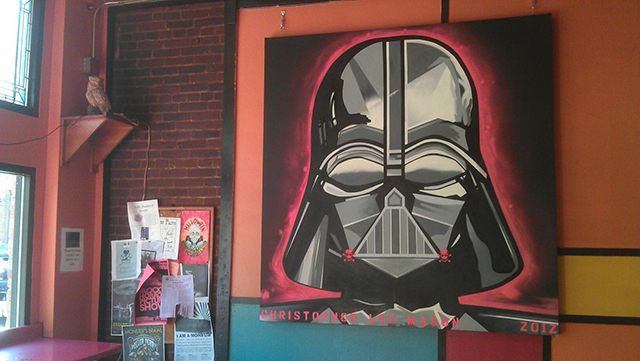 Chris Mason is a graffiti artist who’s now tagging canvasses. Mason has painted all over the state including a mural for PATV18 in Iowa City. He’s also a DJ and music producer. Their juried show runs from Dec. 20 to Jan. 9. Find out how you can get involved at Taag through their website or call them at 621-8223.